Kitchen Knife 9-Piece Set Just $36.96! Down From $120! PLUS FREE Shipping! You are here: Home / Great Deals / Amazon Deals / Kitchen Knife 9-Piece Set Just $36.96! Down From $120! PLUS FREE Shipping! Hurry over to Amazon where you can score this Kitchen Knife 9-Piece Set for just $36.96 down from $199.99 PLUS FREE shipping! Designed to enhance your kitchen experience, the Imperial Collection Stainless Steel Knife Set with Acrylic rotating stand offers the professional quality you need for all your kitchen tasks. Extraordinarily sharp stainless steel blades resist corrosion. 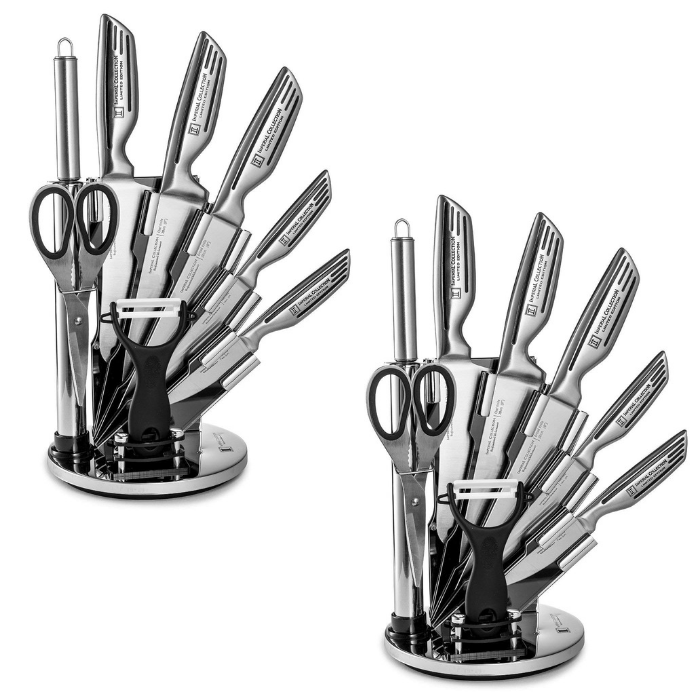 The knife set features strong yet lightweight handles ergonomically contoured for comfort and a secure grip. Stylish as well as functional, this attractive embossed set of knives comes with an eye-catching rotating stand that combines with the luxurious look of the knives for a sleek and modern appearance and it the perfect thing to be prominently displayed on your kitchen counter-top.